Leading Manufacturer of roll to roll uv printer and roll to roll uv led printer 3.2m from Delhi. 1. High precision cross aluminum beam and linear guide rail achieve shigh carriage operating accuracy and reduces noise. 2. Suction of the working platform ensures stable stepping in the printing and smooth printing effect. 4. Uses internationally acclaimed brand UV-LED curing lamp that offers non-deformation, non-cracking, rapid drying and long life. 6. Eco-friendly UV curing ink can directly print on various materials. The key advantage this ink offers is the ability to completely replace traditional spray equipment used for outdoor advertising and indoor photography applications. 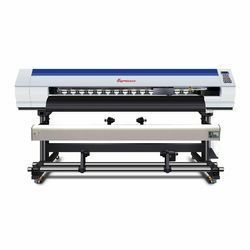 1440dpi overturns the highest resolution of traditional printers which leads the resolution of large format outdoor printing to a new standard. Your new profit pattern will be established and new business opportunity will be discovered. 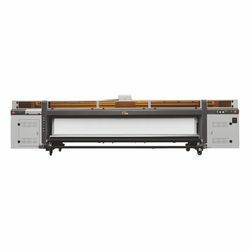 Equip High standard feeding and pneumatic collecting systems, Can print an entire roll of 3.2m material, especially suitable for high resolution printing on Fabric banner/flex and many more.